If you live in a condominium or townhome, chances are you lack a little privacy in your back yard or balcony. We all love neighbors, at least some of them, but having private backyard space is often paramount in living in harmony. If designed properly, a patio or balcony, no matter how small, is still a space that can be a place for both solitude and entertaining. Boundary Fence and Supply Company has the fence and gate for your solution. If you dream it, we will build it! Boundary Fence in Denver offers quality fence and gate supplies with installation. All gates come in standard sizes, however our gate shop can custom build made to fit gates for smaller areas, such as a patio. 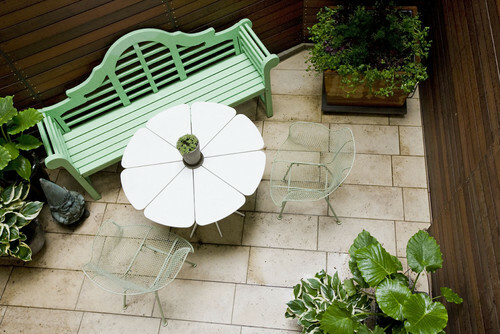 Below are a few ideas to get you dreaming about your small outdoor space. Rooftop terrace? Small balcony in an apartment? We have solutions. In the image above, this small concrete rooftop terrace was transformed into a garden. This space showcases a metal fence for privacy and wood floors. The owners created a garden out of wood boxes to line the metal fence for a modern look. Most standard apartment complexes have concrete balcony walls or iron railing. 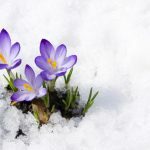 At first glance, it doesn’t look like much can be done to improve the appearance. However, with some professional help this space can become the most favored spot of your home, always beckoning for a cup of morning coffee. Garden level patios offer easier solutions when it comes to gardening around fences or gates. This is sometimes the simplest solution to providing privacy. In the patio above, a privacy screen was added. This would be perfect for unsightly areas, such as around trash cans, or your neighbor’s car on blocks you have been attempting to ignore. 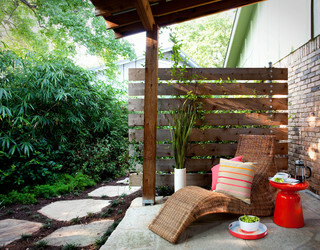 Perhaps, all you need is a tall cedar fence around your patio to provide the security and privacy you are looking for. 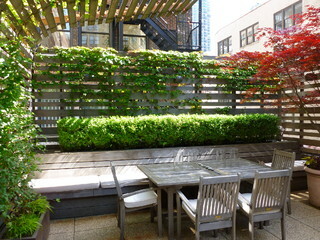 Here is an urban patio, with an enclosed slat fence. Trailing ivy was planted at the base in pots to bring the garden into the patio. This provides semi privacy, while still allowing air and light through the fence. Consider the height of your privacy fence, as well, some neighborhood codes will determine the height. Our specialists always check with code enforcements and will ensure you have a fence or privacy screen appropriately regulated for your home. Another excellent privacy screen is a chain link fence with slats. It provides privacy, is low maintenance and economically priced. The privacy screen is fabric that is placed as slats between the chain links, providing shield from the outside. Our screening fabric is UV resistant, water and air permeable, mildew and air permeable, and helps protects from wind and birds. This fabric is available in a variety of colors. Whatever you choose, come in for a free consultation and estimate. We have been in business since 1973, owned and operated by the Unruh family. Our customers can depend on quality and integrity of service. We will sell and install the best and repair the rest! We take pride in our products and customer service. Your business and satisfaction is important to us, call us and let our expert, professional sales staff provide you with the privacy you need!